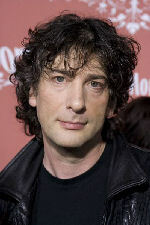 Listen to Neil Gaiman’s Graveyard Book for free! Believe it or not if you go the his website for young readers you can do that by listening to the videos of the video tour he did for the book. Like me you may be surprised that he did this. Won’t this diminish the value of his book? Why would I buy the book now? This kind of thinking is what leaves us in the same place and not moving forward whether it be in the publishing business in general or the audio book industry itself. Giving something so valuable as a reading by an Audie Award winning author does more to bring the joy of his work to more people and brings more people to the pleasures of reading and/or listening to a good book. I have included a video where he talks about this tour and The Graveyard Book. Listen to The Graveyard Book here for free. Here is the video I was talking about. Download Audiobook of the Year 2009 The Graveyard Book and the nominees.